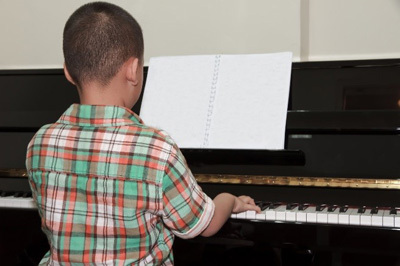 Investing in a piano is a big decision, but if you are serious about getting your child piano lessons and developing his or her musical abilities, you need to make sure your child has a good instrument with which to develop those abilities. This first question is the most important one to answer before you consider anything else. 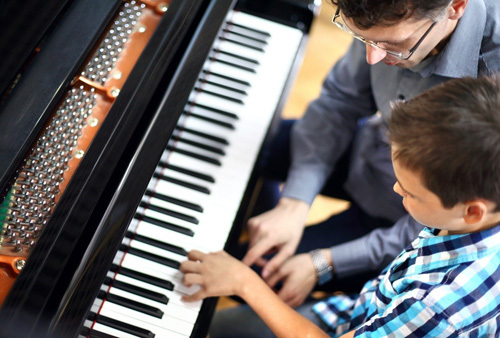 If you want your child to get the most out of his or her musical education, they need to know you are committed to supporting their endeavors with a strong instrument to practice on and providing them with quality piano lessons. Remember to consider the enormous wealth the piano will provide to your child as a medium for self-expression, confidence building, creative problem solving and improving concentration, focus, hand-eye coordination, memory and reading ability. Don’t worry, almost everyone can find a great quality instrument in their price range. Used piano prices are as low as $695 with complete warranties and a free tuning and several digital piano models are even less expensive with a full 88-note weighted keyboard that feels and sounds like a piano. New pianos are more affordable now than ever before. In 1950 a new Baldwin vertical piano sold for the equivalent of 5 to 6-months of the average household income for a family in the US. Today the equivalent piano sells for 1-month of income for the average American family. A grand piano sold for almost 12 months of income in 1950 and today you can buy a quality grand piano for less than 2-months of income. Pianos are more affordable today than ever. What’s the Best Size and Type of Piano for Your Home? Figure out where you want to put your piano, and make sure that the piano you choose will fit. 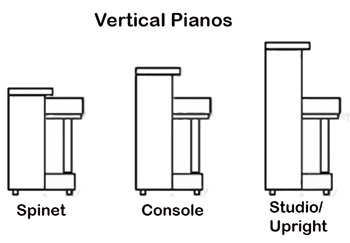 Most vertical pianos are 5’ feet wide, about 2’ deep (from the front to the back of the piano) and they vary in height from 37” to 52” in height. Generally speaking, the “bigger the better” when it comes to acoustic pianos. So, in vertical pianos the height of the piano should be as tall as you can possibly fit and afford. The height of the vertical piano will dictate how large the soundboard is and how long the strings are, and these are the 2 primary factors in creating sound quality and amplitude. If you are considering a grand piano, you will need approximately 5’ square for a baby grand. All grand pianos are approximately 5’ wide… from left to right, that’s how much space it takes to put 88 keys next to each other with a few inches of cabinetry on each side. So, figure 5’ wide. Dimension is the depth of the grand piano or the distance from the front of the keys to the furthest point in the back of the pianos. The smallest baby grands measure 4’ 7” in length and you can find grand pianos measuring almost ever size…as much as 9’ in length for a concert grand. Most homes have pianos between 5’ and 6’ in length. Now, remember how “size matters”? Well, the longer the grand piano from the front to back, the larger the soundboard and the longer the strings; the speaking elements of the instrument. One other consideration thing to consider is soundproofing: if you place the piano in the living room, the family may have to endure a few week or months of faltering scales and the student may have to “fight for time” competing with the television or other family activities. Consider the placement of the piano in your home so everyone can enjoy the beauty and sound of the instrument without challenging your lifestyle. You could also designate an out-of-the-way music room in your house or basement for instrument and pianist alike, but that may make home concerts tricky —once your young pianist-in-training catches on and starts pouring out heavenly, melodious music. Steinway and Baldwin are traditionally the cream of the crop when it comes to piano brands, while Yamaha, Kawai, Hallet, Davis & Co. Boston, Schulze-Pollmann and several other reputable brands are perhaps the most common. New Pianos come with very extensive guarantees, often 10 to 15 years in duration, which may sway your decision to purchase new. However, reputable piano dealers typically offer guarantees on their certified used piano selection as well, with the duration of the guarantee differing with the age and condition of pre-owned pianos. Well, like most things in life, the more you spend, the better the product. If money and space were not a consideration, we would all have a Baldwin, Steinway, Bösendorfer or Bechstein concert grand in our parlor. 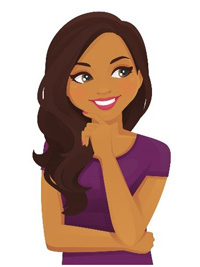 Having said that, B Natural Pianos and PianoCloseouts.com has some GREAT news for those who are working with size restrictions or a limited budget right now; We offer a 100% trade-up policy on all acoustic pianos we sell for a period of 10 YEARS! …and a 100% trade-up policy on all digital pianos for a period of 1 year! 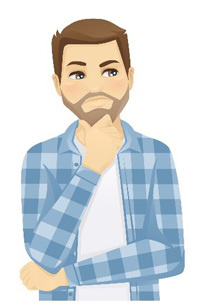 So, you can start, with something affordable at this time and trade it in for a better instrument as your student advances and you have more space or financial wherewithal. 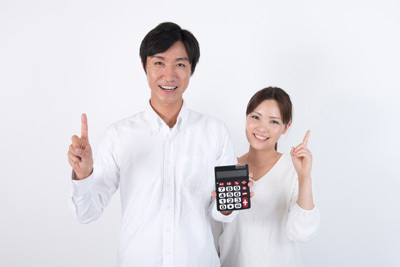 Short-term 0% – zero-percent financing is sometimes available and long-term monthly payment plans can also be worked out, with payments as low as $40 per month. Do you know musical experts you can ask for help? Talk to your child’s piano teacher, and perhaps other families who have pianos. You can also speak with a trusted piano store owner to see what they would recommend for your particular needs. If you can, bring your musical expert with you to the store when you try out pianos. They can give you pointers and tell you what, specifically, to look for before you purchase. Test several pianos in the same location so the acoustics and environment are the same. At the least, play every key on the instrument, with and without the damper pedal pressed down. Then listen to your musical expert play the piano and listen to the volume and tone of the sound. Buying a piano is a very personal decision and everyone has their own personal taste in timbre and tone. Listen and compare. Consider the piano action—is it hard or easy to press down the keys? Young fingers may find it harder to press the keys on some pianos over others. But sometimes a slightly difficult action may be good for developing hand strength. And ask yourself: does the piano have a range of volume from soft to loud? Not just loud-loud-loud all the time no matter how slowly or quickly you press down the keys? Bring your child, too–you’re going to be listening to this instrument for some time, and he/she is going to be playing this instrument for some time, so pick the one whose sound and feel you both like best! Some people advise parents to start out with a smaller, cheaper piano, and then move on to bigger and better instruments as their child develops their pianistic abilities. This is good advice for some, but for those families who prefer to take it one-step-at-a-time, our 100% trade-in program will provide a perfect path for trading up when ready! If you’re going to invest in something as meaningful and long-lasting as a piano, invest wisely. You don’t want to purchase or adopt a lousy instrument that continually falls out of tune—after inviting the music tuner over to fix the darn thing for the fifteenth time in six months, you’ll wish you had chosen a reliable instrument in the first place. Moreover, the kind of piano you choose may very well influence the kind of attitude your child has toward it. If they know how much care and resources you poured into choosing them a quality instrument, they are more likely to take lessons and practice seriously. So, choose wisely and choose well. Purchasing a piano is a big decision, but it’s also an exciting one that will affect you and your child for years to come. For more information on selecting the perfect piano for your child, please feel free to visit our showroom and music learning center and speak to one of our knowledgeable staff.